First up I’d like to ease your mind and let you know that you don’t need to know how to draw to complete this tutorial. It’s basically tracing, except that tracing is alot easier in Adobe Photoshop. Creating line art with this technique will take several hours to do a good job…if you want a tutorial that just applies a couple of filters, then this tutorial is not for you! You will need to know how to use the PEN TOOL for this tutorial. (If you don’t know how to use the pen tool complete the fast tutorial found HERE first). I suggest you read through the entire tutorial first, before you begin. Open your photo in Photoshop. Rename the layer “original”. If your picture is quite dark you will need to lighten it a little. The reason for this is that we will be tracing over the photo in black so we need to be able to see the lines we are creating clearly. Duplicate the “original” layer. Rename this new layer “top”. Create two more new layers. Place them under the “top” layer. Fill the layer closest to the “original” layer white and rename it “background”. Turn the visibility OFF for the “background” and “top” layers.< Visibility ON for the “line art” and “original” layers and the “line art” layer is active. See image below. (All this organisation will be explained soon). We are now set to create the line art. When creating line art you want to vary to thickness of the line (line weight). Varying the line weight emphasizes the perspective of the drawing. As lines become closer the viewers the lines get thicker. Lines taper towards the furtherest part of the object. The image below shows an exaggerated example of this. Also areas that fall into shade can have a heavier line, while areas in light can be represented with a thinner line. A good way to get better idea of this is by studying the line art of comic books. Another technique is to use just two line weights. A heavier line is used for the outer edges of the object and all internal lines are a smaller size. I’m not a fan of this style but each to their own, as long as your picture doesn’t look flat. To taper the lines in Photoshop we need to adjust our Paint Brush Settings. Click on your Paint Brush tool. We need to adjust the brush presets. 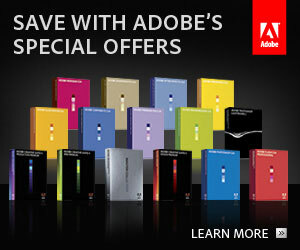 In older versions of Photoshop (CS2 and earlier) click on the brush palette tab at right top of your photoshop screen. See image below. 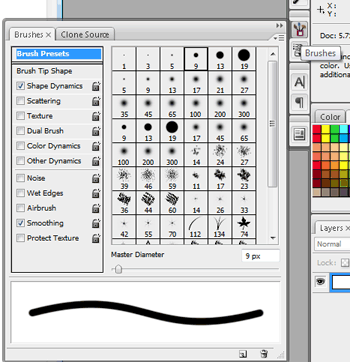 In CS3 onwards your brush palette is available by clicking on the pallete icon on the top or see image below.. The settings you use are going to vary with each line you create, especially the diameter. Below shows one Brush Tip Shape I used. Next click on the Shape Dynamics. 1. Set the Control to Fade. (This will allow our line to taper). 2. Adjust the fade setting. (I’m using 250 here but try experimenting with various combinations of 2 & 3). 3. Adjust the Minimum Diameter. (I’m using 27% here but the key to great line art is variety so experiment). Make sure your foreground colour is black. See image above. The best place to start is the center of focus, which is normally the face. Since I’m using an image of Scarlett Johansson I’ll start on her lips. Remember the point where you start the path is going to be the thickest. Make sure the pen tool is set to Create New Work Path. See below. Create a path paying attention to the angle of the curves. Note: Keep the distance of each line rather short. Don’t try to create one line to go right around the lips. Once you are happy with the path, right click and select Stroke Path… See below. Turn ON the visibility of the white “background” layer. Delete the path (right click and select Delete Path). Now you can clearly see the line you have created. If you are happy turn OFF the white “background” layer and create the next line. If not use your History Palette. See image below. By clicking here you can adjust the curve or paint brush settings. If the line is only slightly off you can use the Eraser Tool. Rather than using the eraser tool in a up/down motion, move it on a diagonal to the line art. That way the line will have a tapered effect at the end. See image below. To create a line that is tapered at both ends like the one shown below. In the brush Shape Dynamics Window change the Control from Fade to Pen Pressure, and the Minimum Diameter to 1%. See second image below. When you select Stroke Path this time check the Simulate Pressure box. See image below. Once you have finished creating an item, like the lips, it’s important to check them against the original. Turn the visibility ON for the white “background” layer. Turn ON and OFF the visibility of the “top” layer. If it looks like the lips are “jumping” then you will need to adjust the line art. 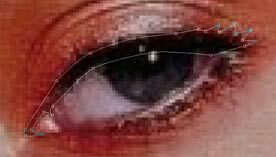 The image below shows the upper eyelash path I created. I also used Fill Path here. To create shapes that are round, square, oval, etc remember to use the Shape Tools. (Found next to the pen tool). The image below shows how I created the iris outline using the Ellipse Tool to save time. I guarantee that you will get faster and faster at this technique of creating line art in Photoshop, so stick with it.